Xochitl Torres Small’s interest in following politics harkens back in part to her National Hispanic Institute involvement in the early 2000s. Throughout her career—including her current role as a water attorney—politics has played a central role in the work she’s done to better her community. 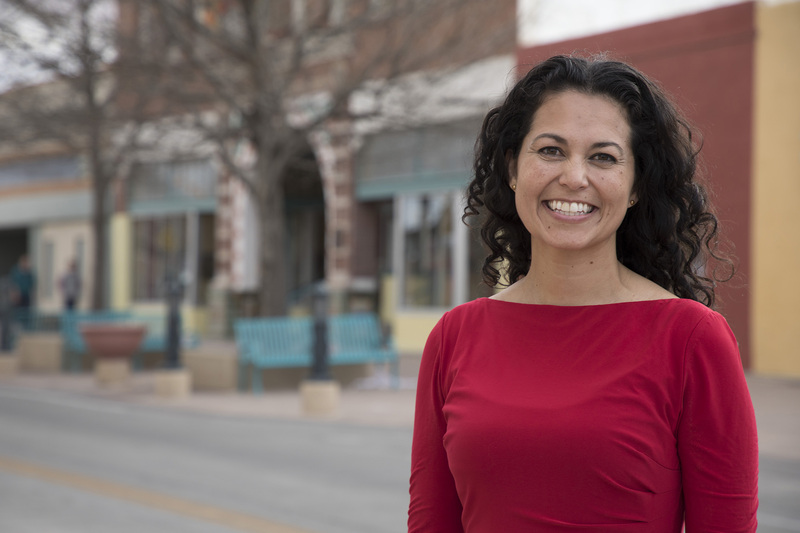 And when longtime Congressman Steve Pearce announced he wouldn’t return to represent the New Mexico 2nd Congressional District in Washington in 2019—creating a competitive race in this unusual political climate—that got Torres Small looking to see who she’d endorse and get behind. And so, in January, she decided to run for the open Congressional seat, and has been moving quickly toward the June 5 primary ever since. Torres Small is no stranger to public policy; she worked as a field representative for Senator Tom Udall’s campaign and in various behind-the-scenes governmental roles. But she has now stepped into the limelight via a campaign where she’s emerging as a compelling Democratic candidate, in what Cook Political Report is naming one of nearly 100 competitive Congressional seats for the upcoming midterm elections. The district she’s running in, in addition to being competitive, is also massive. As Torres Small points out, it’s the fifth-largest Congressional District in the nation, and the largest that is an actual district within a state. (Alaska, Montana, South Dakota, and Wyoming, each larger than NM-2, each only send one at-large representative.) It’s a decidedly rural district, meaning that issues like access to health care and wi-fi are serious concerns. It’s also a majority Latino district that has never been represented by a Latino or Latina—something Torres Small is looking to change. As the New Mexico Political Reporter notes, Torres Small scored a victory at the state’s Democratic convention, getting support from its attendees by nearly a 2:1 margin over her main competitor in the race. She has also won a key endorsement from EMILY’s List, a nationwide organization supporting female candidates, which could prove instrumental in the general election should she advance past the primaries. Torres Small will also draw on her NHI experiences from high school, starting with the 2000 Colorado Great Debate, which she learned of from a Spanish teacher who urged her to participate. She calls that initial program “transformative,” noting that it expanded her ideas of who identified as Latino. “My understanding of leadership changed there,” she added, noting that she learned the importance of collaborating with people who might initially be competitors. Though she didn’t win the Lieutenant Governor race, she collaborated with the winner as a legislator, and was able to get a bill passed in part by being nominated to a task force by the person who defeated her in the election. Though running for Congress is unparalleled in her life so far, the “shedding the fear of the unknown”—which she experienced so memorably in NHI, is something she’s experiencing as she travels the district she seeks to represent. She notes that the lesson of “understanding the value that comes from collaboration that comes from diverse communities” is important, as well as “recognizing that when working within a Hispanic community, it is not a monolith. There’s a vast set of experiences, all of which help serve the community.” She notes that the seven Native American tribes within the district, further adding to the diversity and the complexity of the district. By living and working where she grew up, Torres Small is embodying a talking point discussed in NHI: contributing to the community where you have roots. It is, in fact, an idea that’s driving her campaign. Torres Small seeks to be a leader who not only keeps people invested in their vast district, but helps Washington refocus on the needs of communities like hers. And she could remarkably go from deciding she wanted to be the leader to affect that change at the start of a calendar year to being elected as that leader before that year ends.